Need inspiration and ideas for meals this spring? Our May issue has an Italian theme to bring guaranteed sunshine to your plates! 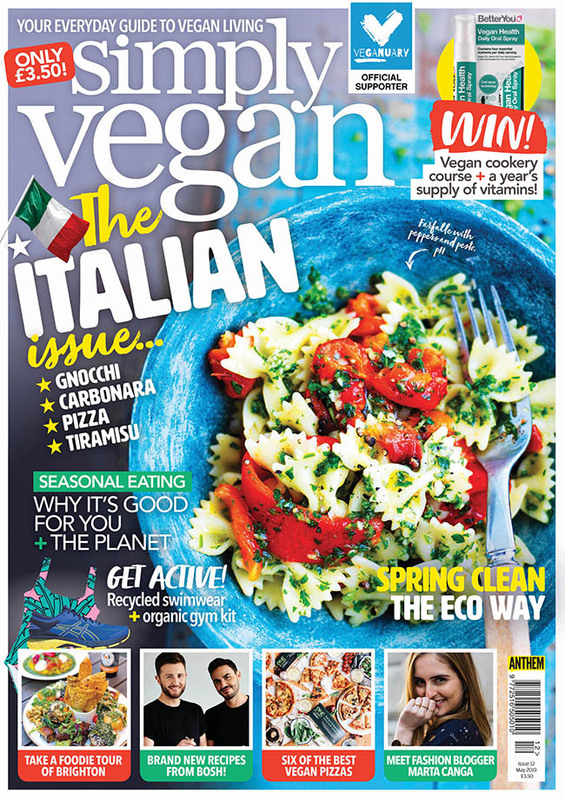 Learn how to veganise all your favourites including lasagne, carbonara, pizza and tiramisu, discover which of your favourite high-street chains do the best plant-based Italian food and find out which supermarket pizzas we rate. Brand new recipes from BOSH! Don’t forget to enter our competitions too – you can win a year’s supply of BetterYou vitamins or a place on a vegan cookery course at Demuth’s Cookery School in Bath. Pick up your copy today in WH Smith, Tesco, Asda, Sainsbury’s, Morrisons and Waitrose. Alternatively, you can purchase your copy of Simply Vegan online and have it posted straight to your door. If you’d like to purchase the digital edition, you can find it here.